The rebel-held town of Kiwanja became the focus of the Congo conflict last night when villagers who had fled returned home to find at least a dozen men in civilian clothes lying slain. The villagers accused the forces of rebel leader Laurent Nkunda of the killings, while Human Rights Watch accused both the rebels and a pro-government militia called the Mai Mai of deliberately killing civilians. Nkunda's men wrested control of Kiwanja on Wednesday following heavy fighting with the Mai Mai - proof that a fragile ceasefire is close to collapse. Today UN Secretary-General Ban Ki-moon called for an immediate ceasefire. He will attend an African Union summit today aimed at bringing peace to the region. He has urged the armed groups involved to find a political solution to the violence that has plagued the east of the country. In Kiwanja yesterday, frightened, whispering residents led reporters to huts where they counted the bodies of 16 people - covered with blankets or sheets. All but two were men, the residents said. None appeared armed. 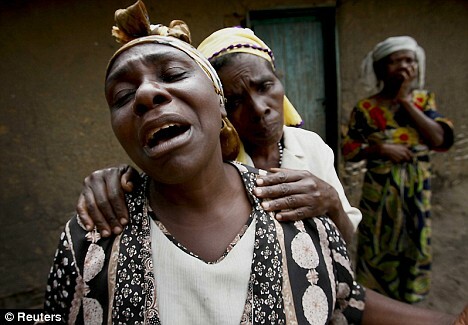 Chorade Muhimdo, 38, said some residents were inside their homes when rebels 'came and shot them'. One woman, 47-year-old Ajeni Niragasigwa, said rebels killed her 17-year-old son while he was trying to cross a rebel checkpoint. 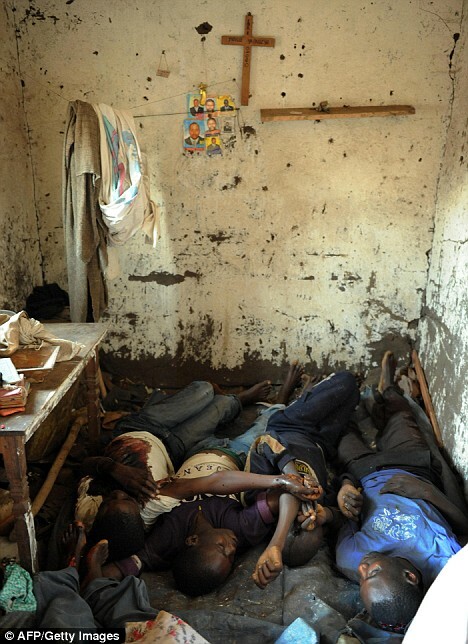 Human Rights Watch said at least 20 people were killed and another 33 wounded during the battle for the town. Yesterday, the director of Community Radio of Kiwanja said rebels killed one of his reporters, accusing him of broadcasting anti-rebel statements. Jean-Baptiste Kiana said he was at the home of the reporter, Alfred Ndjondjo Victwahiki Munyamariza, when the rebels barged in, forced him out of the house, and shot him in the head in his garden. Kiana said Munyamariza, 25, was killed in plain sight of his wife and toddler daughter. The villagers in Kiwanja said rebels had killed unarmed civilians suspected of supporting the Mai Mai, but the rebels said the dead were militia fighters who had been armed. A UN official said Kiwanja was in fact subjected to two rounds of terror: First the Mai Mai arrived and killed those they accused of supporting Nkunda's rebels, then Nkunda's rebels stormed in, killing men they charged were loyal to the Mai Mai. Nkunda's spokesman, Bertrand Bisimwa, said armed government troops and allied Mai Mai militia had infiltrated Kiwanja in civilian clothes and began killing villagers who supported the rebels. Nkunda defected from the army in 2004, saying he needed to protect his tiny Tutsi minority from Rwandan Hutu militias. He has since expanded his mission to "liberating" Congo from an allegedly corrupt government. A U.N. peacekeeping mission in Congo confirmed that Nkunda's fighters captured the villages of Nyanzale and Kikuku. Mr Ban and African leader meet in Kenya today at a summit to try and end the conflict before it engulfs the whole region. Congo President Joseph Kabila is expected, along with Rwanda President Paul Kagame, who wields strong influence with Nkunda's rebels. One of the key issues leaders need to resolve for a lasting solution is the presence in eastern Congo of Rwandan Hutu rebels who took part in the 1994 genocide. Over the past four years there have been various ceasefires and agreements to disarm all militant groups in the region, but little progress has been made on the ground and there have been frequent campaigns by Nkunda. He justifies his revolt as a legitimate one to protect ethnic Tutsis in Congo from the Hutu rebels, known as the FDLR, and says he wants talks with Congo's President Joseph Kabila. 'We just want Rwanda to stop meddling in the affairs of DRC, and show us the proof,' Kabila's spokesman Kudura Kasongo told reporters at the summit, saying that talks between Kabila and Nkunda were 'not on the agenda'. Rwanda denies supporting Nkunda and accuses Congo of backing the Hutu rebels in the east. Meanwhile calls for more peacekeepers in the region are growing around the world to prevent a humanitarian disaster. Aid agencies are scrambling to provide food and medical care to 200,000 refugees crammed into camps around and just north of Goma, near the border with Rwanda. But relief workers say that many of the 1 million displaced civilians in North Kivu are out of reach of help, either cut off by fighting, hiding in the bush or isolated in zones controlled by rebel and militia forces. Ban has asked the Security Council to approve a 'surge' of 3,000 extra troops for the U.N. Congo mission, MONUC, which at 17,000 strong is already the largest in the world. But the two things that refugees and aid agencies in North Kivu province desperately need most - security and protection - cannot be provided that quickly. With donor governments squeezed by the global financial crisis, U.N. officials say mustering the reinforcements for MONUC could take weeks, maybe months. Instead, international figures have been calling for a redeployment of the existing U.N. peacekeeping force. 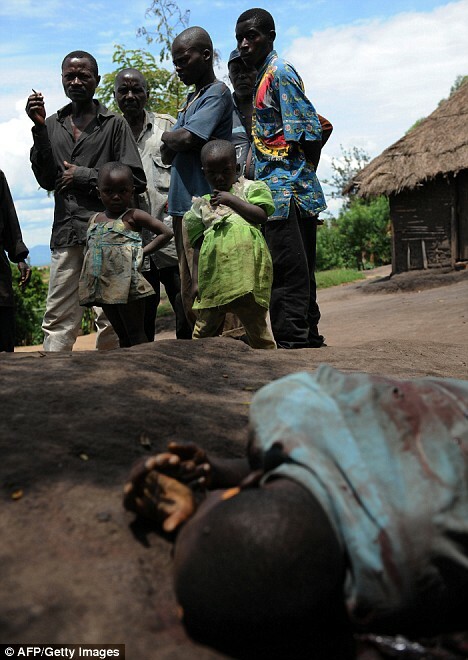 The conflict in eastern Congo is fueled by festering ethnic hatred left over from the 1994 slaughter of a half-million Tutsis in Rwanda, and Congo's civil wars from 1996-2002, which drew neighboring countries in a rush to plunder Congo's mineral wealth. Among the armed groups are the Mai Mai and ethnic Hutu insurgents from Rwanda who fled to Congo after helping carry out Rwanda's genocide.